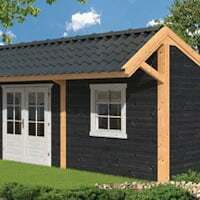 Category – 19mm – 28mm Log Cabins. 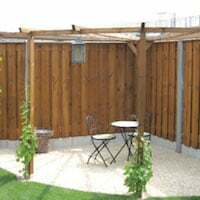 In this category you will mostly find our customer’s reviews on their Tuin 19mm – 28mm log cabins and their journey to install it. We always love to hear our customers opinions on our products and believe that it creates a trustworthy community. 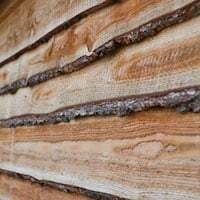 Our posts often come with customer taken images and the occasional video overview/review of our log cabins. 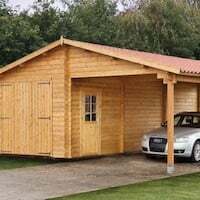 You will also find advice posts so that you can find the best way to install and modify your 19mm – 28mm log cabins to your hearts content. It’s always nice to have customer feedback on our products and service, many customers will send in a review or some pictures, sometimes a video but this lovely personal trainer has given an in depth review on our Kaijsa Studio that she is using as a home gym, it maybe small but Tracey feels it’s big enough for what she needs. Home gym used by personal trainer Tracy Kiss. An excellent experience – the ordering process, communication and delivery are brilliant. The delivery driver was very accommodating and placed the large package exactly where needed, and I might add with great skill! I’ve only just started sorting out the various bits and pieces whilst waiting for more favourable weather and I am struck very much by the excellent quality of all the components. I can’t wait to get going with the build and I’ll submit a further review and some photos then. Keep up the good work Tuin – very impressed! An excellent experience – the ordering process, communication and delivery were brilliant. The delivery driver was very accommodating and placed the large package exactly where needed, and I might add with great skill! I’ve only just started sorting out the various bits and pieces whilst waiting for more favourable weather and I am struck very much by the excellent quality of all the components. Managed, in between showers, to extend an existing shed base using paving slabs and getting it as level as possible. I think this part and setting out the foundation beams absolutely square are critical to ensure a trouble-free build. Laying the first few logs (easy-peasy)! Not a bad idea to keep the door frame in line and vertical and build up to this. as due to its weight it could be a bit tricky to drop it in afterwards especially if you are building single-handedly as I was. Also, I levelled the foundation beams using wooden wedges. The small gaps under the foundation beams were later filled with expanded foam. The structure goes up very quickly. The roof looks daunting but as the timbers are already cut and chamfered it’s really quite straightforward……it’s at this point you’ll discover how square everything is. If things aren’t quite square the whole structure can be man-handled. The positions of the roof timbers will make obvious any ‘jiggling’ that is needed. Now the roof boards go on ( I used 3″ decking screws rather than the supplied nails). At this point I realised that the window frames are easily removed for painting the logs by unscrewing the internal parts of the frame (just 6 screws). This also allowed me to paint the window frames separately in the relative comfort of indoors. Although not really necessary I decided to staple a waterproof membrane to the roof panels as an underlay for the shingles. Test fitted the windows and door, I then disassembled them to paint the individual beadings. Meanwhile started the floor. Again, very straight-forward. A nice touch here is to include a plastic membrane under the joists and then some insulation – in this case 50mm Jablite in between the joists. Ready for the floor boarding now……. 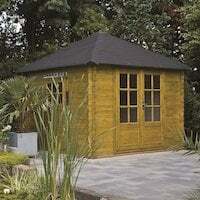 A view of the IKO shingles. I made my own version of the ‘hips’. Also used a 150mm painted steel post cap at the apex of the roof. Have spent the last couple of weeks building it and I am absolutely delighted with my Jos cabin which is now completed. The only minor hitch I encountered was a couple of warped roof timbers. 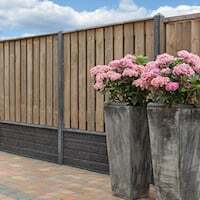 I contacted Tuin who responded very quickly and replaced them within 2 days without any quibble – impressive! And here is the finished job complete with porch light and home-spun window boxes. 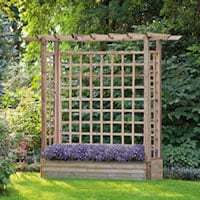 Many thanks for an excellent product – if only I had a bigger garden, I’d build another! Keep up the good work Tuin – very impressed! Thank you Mr W for sending this in. These pictorial reviews really help other people decide if they can install themselves. 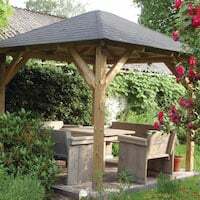 It also gives different ideas such as you roof cap and own made flower boxes, very nice! If anyone would like to send in pictures and a story we always offer further discounts on products, presents and in some cases a cheque. 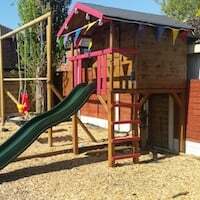 Mr and Mrs Y and recently finished their Ingrid Corner Log Cabin and were really kind in sending us in a picture of the building and also a video which you may enjoy and find very useful. We did muck up a little and supplied three floor boards short, we of course sent them out the following day with our apologies. We do get things wrong sometimes unfortunately. It was very kind of Mr and Mrs Y not to mention this in their review but I do have to hold my hands up that all was not perfect. 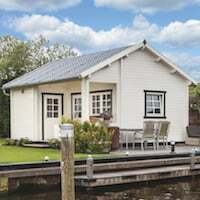 When we ordered the cabin we were a bit anxious as the price was much lower than a similar cabin we had seen locally. We shouldn’t have worried. The cabin surpassed our expectations. The wood was excellent quality and fit. No warps or splits. My husband completed it in 5 days on his own including painting it. All our neighbours have been asking to see it and we’ve had loads of positive comments about how lovely it is to sit in. The tuin team were fantastic to deal with, including the delivery driver. All in all we’re over the moon with it. Delivery was exactly when quoted and the delivery driver was very very helpful. This is their video review that followed on, it is very comprehensive and full of good tips and worth a watch. It is split in half with Mr Y giving commentary on installation and his impressions and Mrs Y comments on furnishings. My wife particularly enjoyed Mrs Y’s blinds that she has made which are very straightforward but very practical and must save a lot of money. 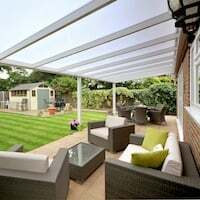 Thank you Mr and Mrs Y, I hope we can help in the future and please let us know if you require any of our products at a very good price as a thank you. This was a present to themselves for their 10th wedding anniversary and I wish you many congratulations and many more years together. 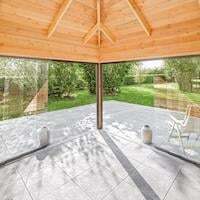 This video was filmed with one of our free video cameras we offer if customers feel they would like to send us a video, it’s a clever one and works well with iphones and ipads. Thank you Mr D, it was very good of you to send this and very useful for other customers.